One method to help you keep your pictures and videos organized on your Droid Bionic is to tag them. A tag is simply a tidbit of text, short and punchy — for example, birthday, grandma, 2012, mountains, or cabin fire. By itself, a tag may seem useless, but the key to properly tagging an image is to apply more than one tag. An image tagged with all its descriptions — birthday, grandma, 2012, mountains, cabin fire — is quite descriptive. 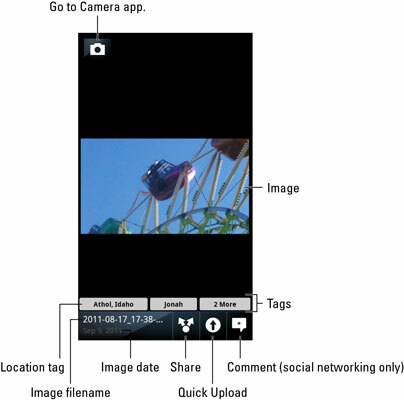 Touch an image to view it by itself on the Droid Bionic touchscreen. Press the Menu soft button and choose the Edit command. Dismiss the Face Tags notice, if one pops up. Type text to describe the image, and then touch the green Plus button to add the tag. Short, descriptive text works best. Use single words, if possible. Try to think about the words you’d use to search for the image, and then create tags using those words. Touch the Done button when you’re finished adding tags. The tags are applied to the image. To see the tags, view the full-screen image. The tags show up at the bottom of the screen, similar to the ones shown in this figure. Touch the screen again if the tags (and other information) hide from view. A tag you can quickly add to any image is the face tag: Long-press on someone’s head when you’re viewing an image. You see a list of face tag options at the bottom of the screen. Choose Me to tag yourself. Choose Contact to tag a contact in the photo. You can also choose Keyword to add a text tag to the image. Tags can be used to organize your images when using Library view. Tagging works only when you remember to do it!